UC President Janet Napolitano, along with Castlemont High School Principal William Chavarin (center) and Executive Director Monica Montenegro of the East Bay Consortium (right), celebrated Oakland Promise scholarship winners on Wednesday, May 30. More than 100 Oakland high school students will receive scholarships to study at a University of California campus as part of a multiagency community collaboration that includes UC. 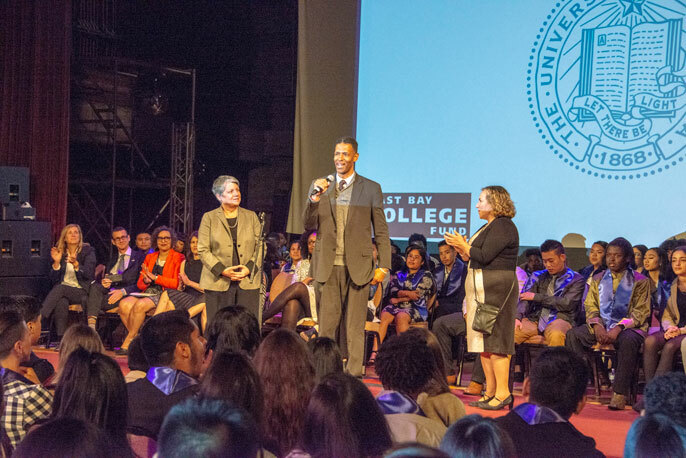 The students were honored amid enthusiastic cheers and applause from community leaders, donors, mentors and the students’ families at the East Bay College Fund-Oakland Promise Awards Ceremony on Wednesday, May 30, at the Scottish Rite Center. UC President Janet Napolitano congratulated the scholarship winners and assured them that the university stands ready to help them succeed. The UC-bound Oakland students were among more than 400 honored at the ceremony who received a combined $3 million in scholarships. The other recipients plan to attend California State University, community colleges or private institutions. In 2016, the University of California Office of the President became an active partner of the Oakland Promise, a cradle-to-career vision that seeks to triple the number of college graduates and make college the expectation across Oakland by the end of the decade. Napolitano is supporting the Oakland Promise to not only shape the future of UC students from Oakland, but to change the landscape of Oakland as a city. This partnership with the East Bay College Fund provides need-based college scholarships and additional services to all qualifying Oakland students from low-income families who are UC-eligible. As part of these efforts, five students receive separate Oakland Promise scholarships each year from the UC Office of the President — a program that Napolitano launched as part of her UC Oakland Partnership that aims to strengthen ties between UCOP and the Oakland community. To be eligible, students must have graduated from an Oakland high school and qualify for the university’s Blue and Gold Opportunity Plan, which covers most college expenses for students whose total family income is $80,000 or less a year. Napolitano has invited the five UCOP-Oakland Promise scholarship winners to a celebratory luncheon in August. UCOP also works with individual UC campuses to create additional Oakland Promise scholarships, raising nearly $1 million over the past two years. More than $215,000 in merit- and need-based scholarships have been awarded by UC to Oakland Promise students who attend UC campuses. At Wednesday’s celebration, community leaders including Oakland Mayor Libby Schaaf and Oakland schools Superintendent Kyla Johnson-Trammell congratulated the students. UC Santa Cruz graduate Alicia Loera, an East Bay College Fund alum who co-founded the East Oakland Dreamers to support undocumented students in pursuit of college, shared a personal story about overcoming obstacles as a Dreamer to achieve her aspirations and thanked Napolitano for her support of the Deferred Action for Childhood Arrivals (DACA) program. The 2018 class of students brings the number of East Bay College Fund-Oakland Promise scholars to 1,100 since 2016.